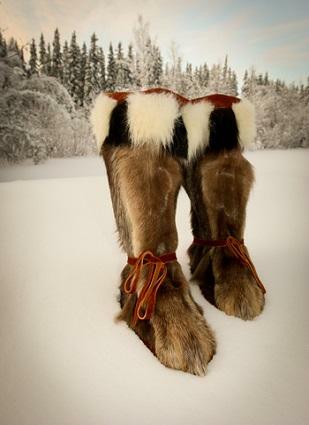 If you want to stay rugged, warm and fashionable despite the cold weather, men's fur boots are a unique option. Whether you're hitting the slopes and need a boot worthy of after-hours mingling, or need a boot that can help maintain your body temperature in extreme weather conditions, nothing beats a fur lined boot. For a "safe" yet fashionable option, consider the Ugg Neumel boot with a grip sole. The brown suede is a versatile choice that will keep you looking pulled together while staying warm in the 100 percent sheepskin lining. If you're more of a traditionalist, you may want to opt for a timeless fur boot option, such as classic Alaskan fur Mukluks. Made from a varied blend of beaver fur, these zip front boots offer easy on and off construction, while the removable faux fur insert allows for easy cleaning and care. For a rugged option that pairs well with flannels and denim, consider a low nubuck or suede boot like the Skechers Revine. Available in dark brown or black, this easy slip on boot features a cozy fleece lining which can be paired with or without socks for your own comfort. Whether you opt for a real or faux fur boot option, you'll want to take care of your investment. It doesn't matter how much or how little you spend, keep your boots in tip top shape so that you'll always look pulled together when you wear them. Fur boots are available in a variety of skins, including rabbit, beaver and fox. Be sure to have your real fur boots cleaned at a reputable furrier for best results. Suede boots should be treated with a leather protectant to help resistant stains and watermarks. To keep your shearling or faux fur clean, follow manufacturer's instructions. Fur boots are a great way to stay warm and rugged during cold and extreme temps while keeping your look naturalistic. With proper care and maintenance, you'll find that fur boots can be a new and cozy twist on the modern man's winter wardrobe.